Winner of:2016 USSB Outstanding International BookIn this retelling of Nankichi Niimi's masterpiece, delicate watercolors bring to life the mischievous yet kind-hearted spirit of Gon, the Little Fox. Readers should proceed with caution as they begin this tale, however, especially as Gon is sure to win over their hearts. 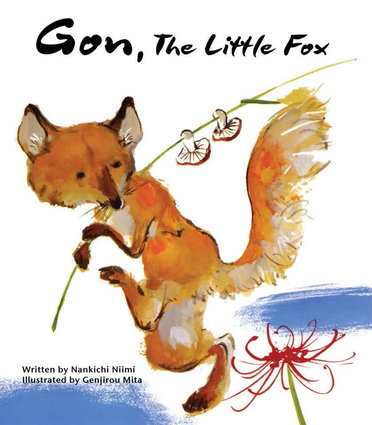 Like many Japanese folktales, Gon, The Little Fox does not exactly end happily; a circumstance which will inspire lively and provocative conversation among young readers. When readers first meet Gon, he is relishing his life as a rascally fox. Each day brings a new opportunity for him to stir up trouble in Nakayama. One day, however, he feels remorse for having killed an eel that was meant for the poor villager Hyoju's dying mother. Ironically, it is this rare moment of conscience that leads Gon down a path that leads to his fate. As with all great folktales, the world of Gon, The Little Fox is both extremely familiar and extremely mysterious. This quality, as evident in both the text and illustrations, will greatly appeal to readers, both young and old. Nankichi Niimi was an author of children's books in Japan. Though he passed away at the age of 29, he had already written a number of children's books, novels, poems, children's songs, and plays during his short life. Genjirou Mita was an artist and children's book illustrator. He was a three-time winner of the Sankei Children's Book Award for his illustrated books, and was the president of the Japan Art Association from 1989 to 1995.